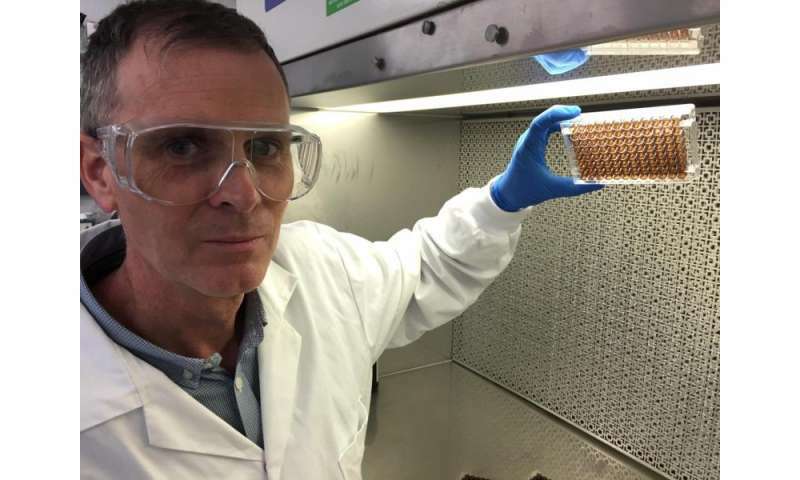 Australia's national science research organisation, CSIRO, has developed an innovative new coating that could be used to improve medical devices and implants, thanks to a "goo" thought to be have been home to the building blocks of life. The molecules from this primordial goo - known as prebiotic compounds - can be traced back billions of years and have been studied intensively since their discovery several decades ago. For the first time, Australian researchers have uncovered a way to use these molecules to assist with medical treatments. Lead researcher Dr Richard Evans (right) from CSIRO said hundreds of thousands of Australians receive medical implants like bone replacements, catheters and pacemakers every year. "The human body is a complex system so there is a lot to consider when implanting artificial parts," Dr Evans said. "Reducing the likelihood of infection and ensuring the body doesn't reject implants are ongoing medical challenges. "That's why coatings on these implants are needed to help them to do their job. "We wanted to use these prehistoric molecules, which are believed to have been the source of all life evolving on Earth, to see if we could apply the chemistry in a practical way." The team discovered that the coating is bio-friendly and cells readily grow and colonise it. It could be applied to medical devices to improve their performance and acceptance by the body. This could assist with a range of medical procedures. "The non-toxic coating (left) is adhesive and will coat almost any material making its potential biomedical applications really broad," Dr Evans said. The researchers also experimented with adding silver compounds, in order to produce an antibacterial coating that can be used on devices such as catheters to avoid infections. "Other compounds can also be added to implants to reduce friction, make them more durable and resistant to wear," Dr Evans said. The coating process the scientists developed is very simple and uses methods and substances that are readily available. This means biomedical manufacturers can produce improved results more cost effectively compared to existing coatings. CSIRO is the first organisation to investigate practical applications of this kind using prebiotic chemistry. "This research opens the door to a host of new biomedical possibilities that are still yet to be explored," Dr Evans said. CSIRO is seeking to partner with biomedical manufacturers to exploit this technology. The findings from the research were published in the Nature journal, Asia Materials today.